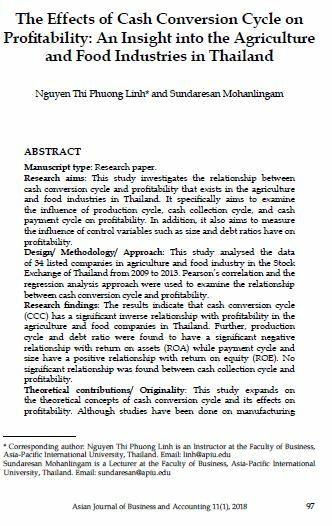 Research aims: This study investigates the relationship between cash conversion cycle and profitability that exists in the agriculture and food industries in Thailand. It specifically aims to examine the influence of production cycle, cash collection cycle, and cash payment cycle on profitability. In addition, it also aims to measure the influence of control variables such as size and debt ratios have on profitability. Design/ Methodology/ Approach: This study analysed the data of 34 listed companies in agriculture and food industry in the Stock Exchange of Thailand from 2009 to 2013. Pearson’s correlation and the regression analysis approach were used to examine the relationship between cash conversion cycle and profitability. Research findings: The results indicate that cash conversion cycle (CCC) has a significant inverse relationship with profitability in the agriculture and food companies in Thailand. Further, production cycle and debt ratio were found to have a significant negative relationship with return on assets (ROA) while payment cycle and size have a positive relationship with return on equity (ROE). No significant relationship was found between cash collection cycle and profitability. Theoretical contributions/ Originality: This study expands on the theoretical concepts of cash conversion cycle and its effects on profitability. Although studies have been done on manufacturing firms and industrial SMEs, no study has focused on the agriculture and food industries in Thailand. Practitioner/ Policy implications: Insights gained from the findings can be used to improve working capital decisions and to provide policy directions in the management of agriculture and food industries in Thailand. This study is especially significant as it deals with perishable goods where time is of vital importance for the inventory, collection and payment cycle management since these factors have subsequent influence on firm profitability. Research limitation: This study is limited to 34 listed firms in Thailand and for a period of five years due to the limited access to the annual reports of firms. In addition, some annual reports were only available in the Thai language which hindered the interpretation of data for the current study. Therefore, future studies should investigate the agriculture and food industries of other ASEAN countries by studying the same relationship for comparison. Keywords: Cash Conversion Cycle, Production Cycle, Cash Collection Cycle, Payment Cycle, Profitability, Working Capital Management. LINH, Nguyen Thi Phuong; MOHANLINGAM, Sundaresan. The Effects of Cash Conversion Cycle on Profitability: An Insight into the Agriculture and Food Industries in Thailand. AJBA, [S.l. ], v. 11, n. 1, p. 97-119, june 2018. ISSN 2180-3137. Available at: <https://ajba.um.edu.my/article/view/12148>. Date accessed: 25 apr. 2019. doi: https://doi.org/10.22452/ajba.vol11no1.4.